Varicose Veins and spider veins are no fun for anyone. Not only are they aesthetically bothering for people who suffer from them, but can also be painful and indicate degenerative stress at the cellular level. In this episode we take a look at the common causes of varicose veins and discuss dietary and supplement strategies that may help you heal. 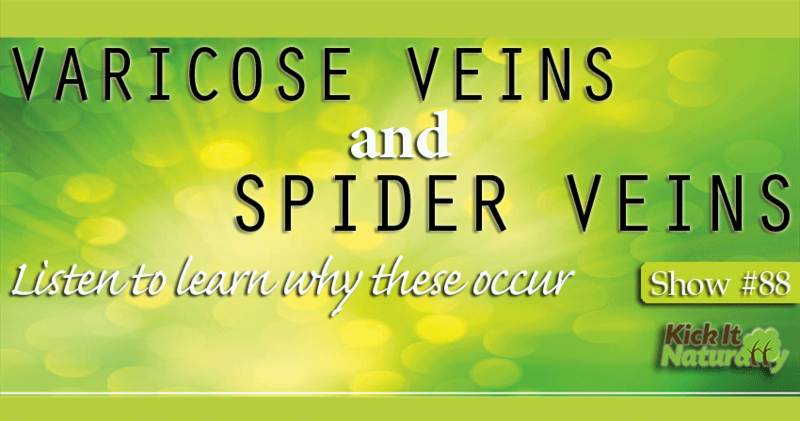 There are multiple factors to look at when trying discern what is causing varicose veins. Some dietary factors that commonly contribute to varicose veins include protein deficiencies, vitamin C deficiencies and nutrient deficiencies in general due to weak digestion. Hormonal, environmental and nutritional causes of inflammation can powerfully contribute to varicose vein symptoms. Elevated estrogen, cortisol, polyunsaturated fats and starches can all inhibit regular cellular respiration and contribute to inflammation, thereby worsening symptoms of varicose veins. Nutrients that support cellular respiration can often reduce inflammation and help relieve symptoms of varicose veins. Which particular foods/nutrients that will help you reduce your personal symptoms of varicose veins depends on what’s truly causing your symptoms in your case, but we frequently find the following effective: collagen/gelatin protein sources, whole food sources of vitamin C such as acerola cherry and camu camu.